The New Jersey Forest Nursery grows over 25 evergreen and deciduous tree and shrub seedling species in Jackson, NJ. The nursery sells bareroot tree seedlings through the Seedlings for Reforestation program, in packs of 100. For more variety and fewer trees, the nursery also offers the Home Grown program, with a pack of 30 seedlings of three different species. 3rd Grade Tree Team program offers free seedlings to third grade students when requested by their school. Read Bareroot Seedling Planting and Care [pdf 943k] to help make your conservation plantings a success. 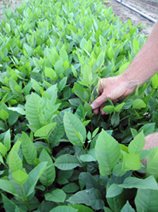 Please view the 2012 Tree Seedling Catalog for species list and order form. 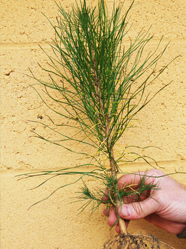 The reforestation program provides public and private landowners tree seedlings for reforestation. Reforestation is important part of conservation in New Jersey's forests. Please note: the species listed on this web site are provided as a guide only and may not reflect the actual nursery stock. Contact the nursery at (732) 928-0029 for an up to date listing of available seedlings. Trees must be planted in New Jersey. Trees are not allowed to be resold as christmas trees or nursery stock. Please view the Home Grown Tree Program Order Form for ordering information. The Home Grown Tree Program allows New Jersey landowners to buy packets of seedlings for their property. For just $25, you will receive a variety pack of 30 bare root seedlings. Plant them anywhere in New Jersey. Beautification - these aesthetically pleasing species will add beauty to your landscape. Watershed - these species are best planted in wet or moist soils and also help prevent runoff. Wildlife - these species provide food and habitat for a variety of birds and wildlife. Please view Third Grade Tree Team Order Form for ordering information. This state wide program entitles every third grader in New Jersey to a free tree seedling when requested by the local school. It acquaints young students with the value and importance of trees, increasing environmental awareness and teaches students about the benefits of trees. The seedlings are a perfect way to get students involved in environmental activities, especially during Earth Day and Arbor Day. Trees are available in April. Schools must register by March 15. View How to Care for and Plant Third Grade Trees for help planting your 3rd Grade trees. Keep acorns dry and cool so they do not sprout. Sprouted acorns are not viable. Although we do have other oak species in New Jersey, the nursery only needs acorns from pin oak, red oak, and chestnut oak.